Residential Commercial Interior and Exterior Masonry. In 1967 Roland Street, II (Stubby) and Dee Street moved to Sun Valley, Idaho. Stubby worked for Sun Valley Company for two years before deciding to become a mason. Thus began a legacy of masonry with projects strewn across the United States from Kauai and Maui to New Orleans, monuments to professional masonry design and construction. After studying with a local masonry contractor for three years, Stubby ventured out on his own in 1971. He learned the codes and fundamentals of structural masonry, but enjoyed the freedom the stone veneer gives a mason, who is an artist, as well. He brought that commitment to his stonework, which reflects his “good eye” for design, his perfectionism and attention to detail. In time, Stubby’s son, Roland III (Baba), also became a mason and joined his father in Street Masonry. Together they have grown the company, and established a training program for masons and apprentices, where high standards of quality are taught. Roland III is the president, and maintains exemplary quality control. The Streets now have a combined 69 years experience in the masonry industry. Aesthetic demands of contemporary architecture involve combining modern reinforcing techniques with ancient and venerable brickwork and veneer work. Structural integrity in masonry is challenged more and more in modern architecture, as new designs and ideas for aesthetics, as well as function emerge. One particular design involved “sandwiching” a 12 foot piece of thermo paned glass in the stone veneer, creating a see-through effect of the rockwork, which is a 38 foot chimney outside of the house, and a 25 foot rock face inside the house. 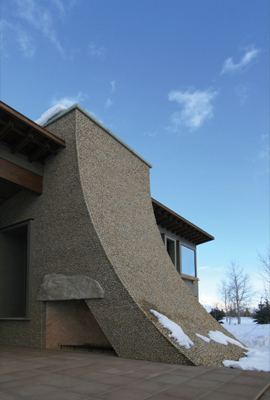 The design was innovative at the time and the challenge was how to 1) weatherproof the seal of the window, 2) maintain its structural and functional integrity, and 3) enjoy the beauty of the stone veneer. Most recently, design construction for Street Masonry has involved a small bridge entryway for a church building, creating an atrium entrance over a sunken main floor and garden area. Here again, the challenge was to maintain structural integrity, yet express all of the beauty of the rocks and the architect’s vision. Sometime around the 1950’s, masonry design started to take a good look at reinforcement techniques. Earthquakes had had a devastating effect on masonry buildings, particularly buildings constructed without steel or grouting techniques. When a wall is filled with grouted bricks, and a steel grid is placed at intervals, the wall will prove to contain more strength and therefore resist the negative impact of an earthquake. It was determined by engineers that concrete buildings and structures needed to be able to “flex,” leading to improvements in reinforcement techniques, including the use of steel in foundations and walls, improved grids for applying that steel, and better formulas for the specifications on sizes and shapes of products. Street Masonry masons study these formulas for the specifications of materials, work with the architects and the CADD (Computer Aided Drafting and Design) engineers to conceive and build the most efficiently functioning and aesthetically beautiful structures in the industry. The 12 foot window in the rock wall, which was mentioned earlier, withstood the 1983 earthquake, a 7.3 on the Richter Scale. Street masons were both pleased and excited to find that the glass had neither broken nor cracked. Masons across the industry have since adopted the technique the Street masons used for that installation. The Street masons are capable and committed to efficiency and satisfactory production from concept and design to completion of all residential and commercial masonry, including CMU buildings, ten thousand square foot homes, uniquely superior one-of-a-kind water features, pools, hot tubs and more. From projects such as a three-story block building built to specifications, to custom designed fireplaces and veneers, to landscape water features, with all the uniqueness a client can imagine, the Street masons have demonstrated their ability to remain true to their goal to please the client, exhibit a professional manner, and excel in their field with a product that is superior by design and function, built with expertise extracted from a thirty-five year legacy. Street masons share an overall objective that their work might still be standing one hundreds years from now, approaching every masonry project, everyday with that goal in mind. 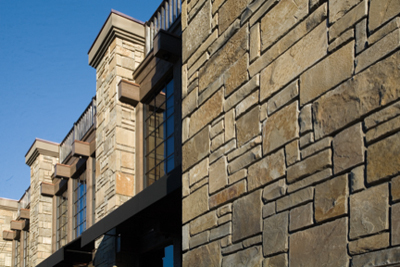 Street Masonry procures much of its natural stone products from local quarry, Sun Valley Stone Company, first established in 1978 as First Light Industries. 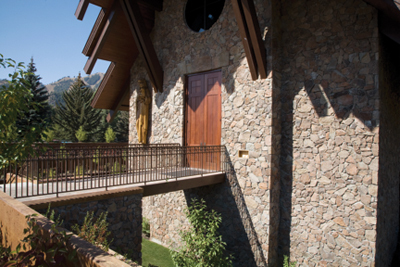 Sun Valley Stone Company is owned by Roland Street III, son of the founder of First Light, and Rick Greener, each bringing decades of experience in the construction and stone trades. They are the exclusive providers of the much sought after Idaho Granite, rightfully nicknamed “Stubby Stone,” in addition to stone products for the exterior and interior construction of commercial and residential projects, and landscaping. They are highly committed to renewing and maintaining the tradition of high-quality, uniquely Idaho stone, and expanding the awareness, use and enjoyment of these products.